Luke 11-17 continues The MacArthur New Testament Commentary's look at the longest of the four Gospels. Luke is unique in its historical detail and for how it positions Jesus as the Savior-King not just of the Jews, but of all mankind. 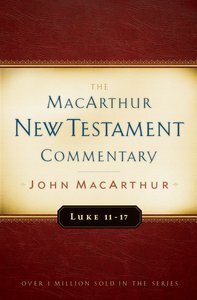 About "Luke 11-17 (Macarthur New Testament Commentary Series)"
Luke&11-17 continues The MacArthur New Testament Commentary's look at the longest of the four gospels. The commentary provides a verse by verse and phrase by phrase exposition of the text, taking into account the cultural, theological, and Old Testament contexts of each passage. Interpretive challenges are fully dealt with, and differing views are fairly evaluated. The gospel of Luke is unique and provides valuable insight into Christ's life and ministry. For example, it gives the fullest account of Christ's birth and is the only gospel to record several of our Lord's parables, including the Good Samaritan and the Two Sons. Use this volume of The MacArthur New Testament Commentary series to assist you in your study of this cherished New Testament book.